The CPP7000-X comparison test pump serves as pressure generator for the testing, adjustment and calibration of mechanical and electronic pressure measuring instruments through comparative measurements. 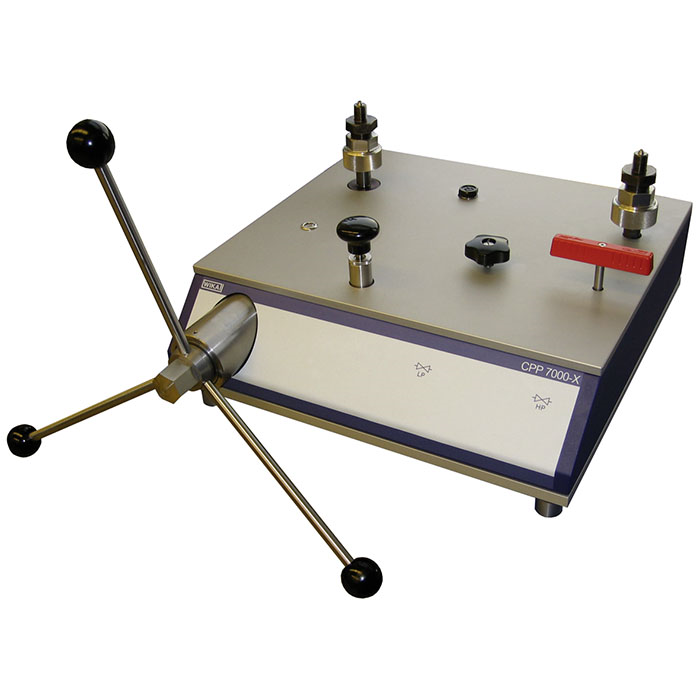 These pressure tests may be carried out in the laboratory, workshop, or on site at the measuring point. For a precise approach to the measuring points, the comparison test pump is fitted with a spindle for fine control. In particular, the smooth running of the hand spindle enables this, even at very high pressures. The CPP7000-X is further characterised by the spindle which runs solely within the pump body. This eliminates an unfavourable bending moment on a spindle that has been unscrewed. This also has the advantage that the dimensions of this pump do not change during operation due to spindle rotation. With the comparison test pump, large test volumes can be easily filled and primed with the integrated priming pump. If one connects the test item and a sufficiently accurate reference measuring instrument to the test pump, on actuating the pump, the same pressure will act on both instruments. By comparison of the two measured values at any given pressure value, a check of the accuracy and/or adjustment of the pressure measuring instrument under test can be carried out.